GUICCIARDINI - Domus Hansae Teutonicae / Sacri Romani Imperii. GUICCIARDINI, L. - Domus Hansae Teutonicae / Sacri Romani Imperii. Domus Hansae Teutonicae / Sacri Romani Imperii. - GUICCIARDINI, L.
Title : Domus Hansae Teutonicae / Sacri Romani Imperii.. Size : 9.2 x 12.4 inches. / 23.3 x 31.5 cm. Description :From Ludovico Guicciardini. 's description of the Netherlands "Beschrijvinghe van alle de Nederlanden anderssins ghenoemt Neder-Duytslandt", published by Willem Blaeu. 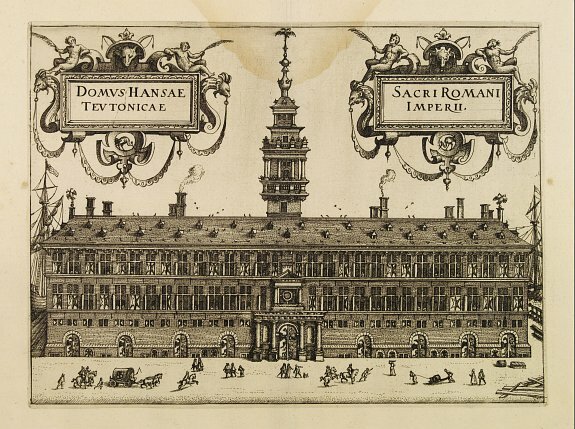 A fine print of the townhall in Antwerp. Condition : Water stain in upper part of the sheet, entering 3,5 cm into the image. Dark impression.